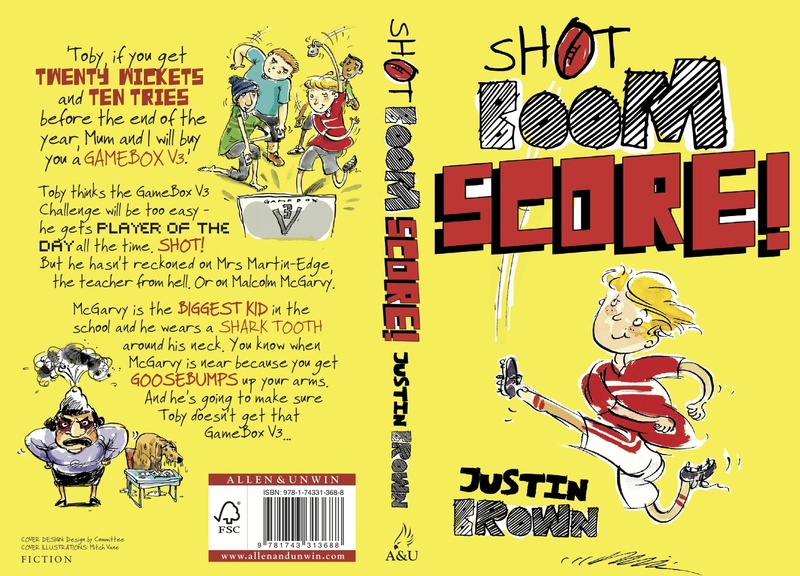 Lots of humour and home spun philosophy from Justin Brown such as: ‘One day is like scoring a goal in the Cup Final, the next is like being bowled first ball by a girl.’ I know how it feels. Primary and intermediate in appeal especially to reluctant boy readers who love sport. A laugh out loud tale for all sports lovers! Cricket and rugby are themes but Toby lives and breathes all sports, is loyal to his mates, and is a likeable character. Over all I rate this fantastic book 9 out of 10. When your mum or dad says go to bed and stop reading you sneakily keep reading because your on a cliff-hanger, then suddenly you’re already done, then you start having a melt down. Well the only downs in this book are probably…nothing so I should probably rate this 10 out of 10 but I don’t want to be too nice. Once again it was totally awesome. This book is about if Toby gets 20 wickets and 10 tries by the end of the season he gets a gameboxv3 but this big bully called mcGravy try’s to stop him from getting that game box so will Toby get those wickets and tries before its to late? And this book is very funny. In the interests of instilling a love of reading in our children we read to them. A lot! What is crucial is that the books we read grab their attention and keep them riveted. And if it can keep the parents who have to read it entertained as well its a welcome bonus. And finally, if there is a lesson or two in there, subtle enough not be be seen as lessons, then great! The whole family enjoyed this book. My wife and I read some each night with the kids always begging for more, no matter how much we read. We had to learn to stop early, then agree to ‘one more chapter’. The adults enjoyed the book as much as the kids because it took us back to what it felt like to be young, and the challenges and issues we faced. When Jill was reading I also wanted ‘just one more chapter’. I got the distinct impression the author has not grown up himself, which is just what’s needed in a children’s book author. Justin captured what it was like to be a kid as if he was still living it. We are reading it for a second time now, and like the Pixar movies, I am sure not for the last time. Brilliant!